Stop, all this passing has sense. I used to think that these words were addressed solely to young people who take their important life choices and find their vocation to consecrated life. But is that really so? I have also decided to follow him. I was surprised when I discovered,, as a young wife, how much this urge to follow Jesus influenced my marriage. I was also surprised when I discovered, as a young mother, how much my will and our will as parents to follow Jesus influenced our relations with children. How much the faithfulness in this decision helped us in this difficult process. I never stop marvelling at how demanding it is in professional life and also – how often it s put to the test. How often it is assessed and checked. How often the temptation comes to just quit and hide. I do not know whether my following Jesus has brought about a big catch. Not really, but I would like it to be a clear testimony. And I wish you the same! When we give vent to our imagination, a fragment the Gospel for today can really frighten us. It is the description of things to happen shortly before Jesus’ second coming (Luke 21, 20-28). It’s so good that we’ve been warned! It’s so much easier to face up to difficult things when we can prepare for them beforehand. It’s a little bit like preparing for the marathon:) It’s necessary. ‘.. stand up and lift up your heads, because your redemption is drawing near’. We can start today, practising standing up and lifting our heads, with optimism and hope for the good that awaits us- and especially when we experience fear and oppression, when reality seems unbearable. We can always look ‘up’ – up there there’s always consolation and peace. – I am also a WINNER. When in Florence I was boarding the plane to Frankfurt, I spotted a young and athletic dark-skinned guy. He walked, accompanied by two managers (? ), slightly limping. We met again in Frankfurt, sitting next to each other’s tables in the restaurant zone where I was to wait for 5 hours for my connection to Warsaw. I was wondering whether he’d won the marathon, so I just went towards him and asked (on the plane I saw the photo of the fastest few, neither of them was white). 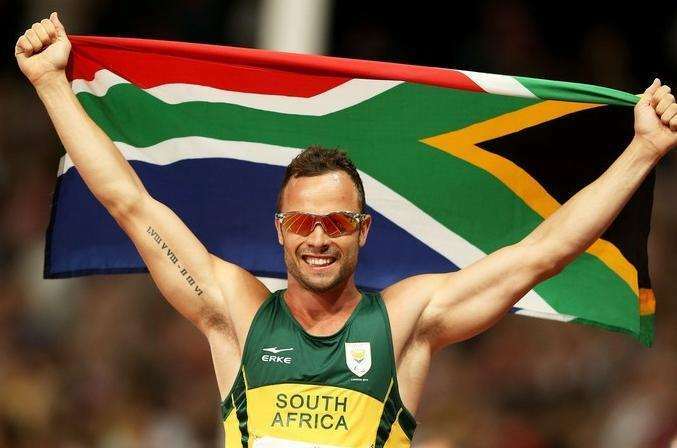 However, it turned out that he hadn’t because of the injury that had thwarted his plans of winning. He came… fourth. Time: 2:12. They asked about my time, too. ‘Almost 2 hours later, but 16 minutes before the last one’ , I said. And later, when the men left to catch their plane, I saw that one of them had left a charger cable. I chased off after them and caught the marathon runner. He thanked me whole-heartedly we shook our hand and said goodbye with a smile. We, the marathon runners. may score different times at the finishing line but we all respect one another because each of us has to win over ourselves. Thank you very much for all your kind words of support and congratulations. We’re all one in everything. Yesterday each of us proudly exposed their medals. In the restaurants, in the streets. Those who ran understand it very well; and let those who didn’t – at least see them 🙂 A medal that we put in a rucksack today will be a reminder and motivation tomorrow. We’ll be going back soon. This was the second time I’d visited Florence bacuse of the marathon and I must say that I know this city quite well from the perspective of 42,195 km (of course, multiplied by 2). 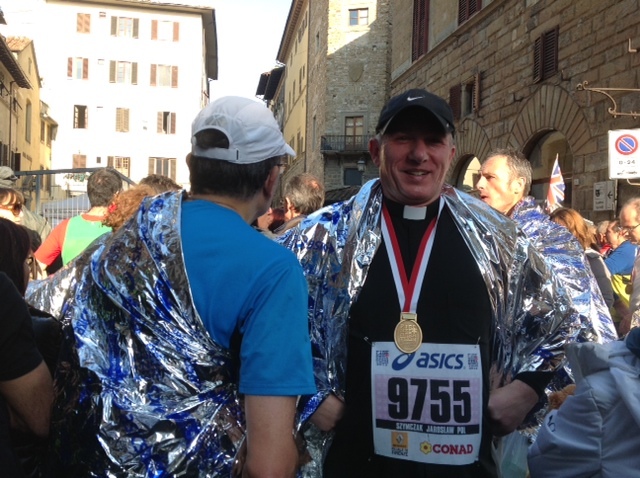 And since I went then only because of the marathon, I took the last plane to Florence and the first plane after the race. There was not time to do any sightseeing. Maybe I’ll do it next time I run the marathon? Afterwards – looong waiting time for a change in Frankfurt and a late return home. After the last marathon, since that was not yet the end of the season, I heard the following advice: ‘This week’s going to be a rest. Running only 3 times 12-14 km’. That’s how marathon runners take their rest. But now it’s the end of the season and we can laze around a bit. Winter is the time to get in shape. I don’t really have better running experiences than running on fresh snow in the forest. Of course it’s harder but instead the running strength grows. And we’re getting prepared for the marathon in the spring because there is still weakness that we have to overcome, and because we have to ask more of ourselves, because… Everyone fills in something for themselves. See you on the running tracks. See you in the spring (or later) somewhere at the marathon. This is His day, His holy day, glory be to Him. 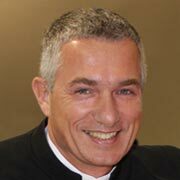 That is how I reacted to the best wishes of perople who greeted the running priest. Viva Christo Re! The marathon is completed, and this with the result of my life. I do not know yet precisely, what the time was because just before the start my watch let me down and refused to operate. I know that the gross result was 4:14. The tail of the marathon where I found my proper place had to wait for a while before the time was measured. The strategy was as follows: I start with those who ran 4:30 and than after a while I leave them and run at my own pace. Then I catch those who aim at 4:15 and I run to the finishing line. That’s what I did. I caught them before the half-way point and since I enjoyed running, I went on going at my own pace. The idea was that if I hit the wall, I could always come back to them. And I was right. Though I finished before them, I owe it to their pace makers that in spite of weakness I worked myself up and kept the pace. 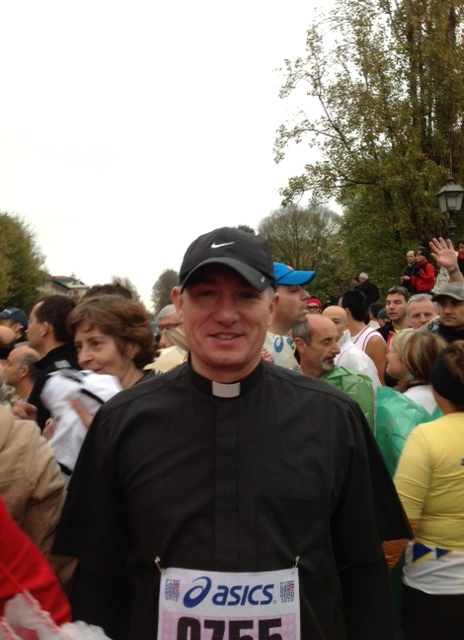 I understand now St. Paul even better when he writes that he’d finished the race and kept the faith. Because at the merathon it is often like that that – at the end the only thing that’s left is faith and motivation. I offered my run in this marathon especially for the families – for all the communities, although particularly for the newest ones, and for all the families I work with – especially those who experience the greatest difficulties. Maybe that’s why it was so hard in the final part of the race. Marathon is something special. This is a big challenge, an opportunity to face up to a real weakness when all that’s left is the will to fight while the body says “Enough”. On many, exceptionally many occasions I saw other runners who gave up or, worse still, were taken by ambulances. This shows that it is s true challenge. We know very well what’s happened with our runner at the half-marathon on the Uznam Island. I am proud of him because he didn;t give up and he keeps on training. Next year we’ll fight again. And now we’re going to celebrate. I’ve received the start number. After a short night… first by train to Florence, then a run to Andrzej and together to the place where the marathon is going to start tomorrow. 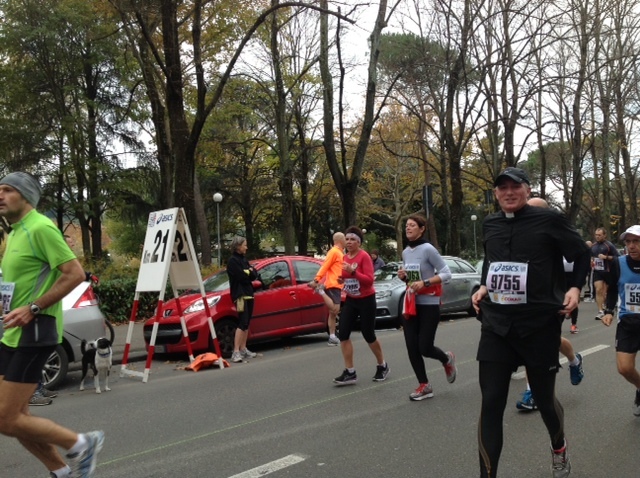 I’ll run with a Friend who encouraged me to take part in the marathon – and took me to the marathon in Florence two years ago. It was my first one and my first result: 4:34:19. In September I ran from Świnoujście, Poland, to Wolgast, Germany: 4:24:12. this time maybe itill be 4:14? Today I can hardly believe it. It’s been the day of a crisis, but also of a great excitement. Anyway, the marathon is just about to begin. At 9:00 p.m. European time. Please, bear in mind the prayer-support-for-Father-Jay emergency till 13:30 at least. I’ll let you know as soon as I’ve made it. Today I’m flying to Florence. I’ll have to change planes once. It’s easy to say who’s flying to the marathon. Those people are wearing sports outfit, worn-out running shoes and their bodies point to some sort of regular physical activity. We recognize each other quite easily at the airport. Sometimes nodding your head is eanough (we’re from the same “branch,” so words are useless), sometimes you hear a distinct “good luck”. Each of us hopes to win. To win your life record, to win your weakness, to run using your head, keep the strategy and… experience that incredible joy at the finish line – the reward for all the toil. And the fever I’ve mentioned? As usual I start feeling pain in all parts of my body and what dawns on me is actally the fear of the distance (42.195 km!!!). So I’m asking myself: will i make it? the question returns in all shapes and forms. Time will tell. The day after tomorrow. Your Guardian Angels would me more than welcome on the way. Because all those marathons of mine – are offered for you, Dear Families, so that you can make it till the end, despite the pain, despite the questions if its worth taking the toil… And when your marriage turns 42 years and 195 days, I’ll run another marathon. Because we need you. We need your perseverance over the years and your smile as our paths cross on the running routes – as without you, the world will go astray. See you at the finish. 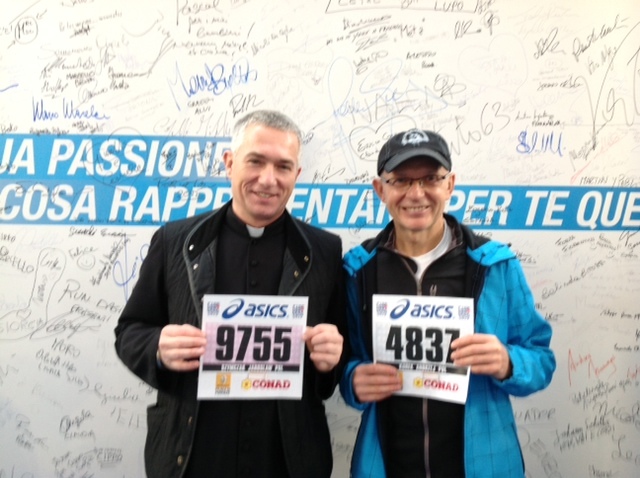 You can view this one at www.firenzemarathon.it My start number is 9755.